Model 2000 Random Loaded Hopper handles many different sizes and shapes that need to be O.D. ground. Loading is no problem. These feeders can be designed to use dump stands, dumpers and metering hoppers to add capacity and auto load your Feedall. Bushings are fed from a random loaded, floor mounted hopper. Bushings are elevated from the hopper via a cleated belt and discharged in a continuous, end-to-end stream to the work rest of a centerless grinder. Feeds differential shafts from a random loaded, floor mounted hopper. The differential shafts are elevated from the hopper via a cleated belt and fed in a continuous, end-to-end stream to the workrest of a centerless grinder. Valve seat inserts oriented in a continuous, diameter-to-diameter, vertical stack and fed into a variable speed pusher device. 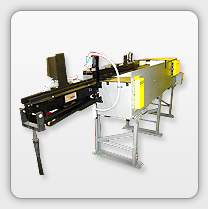 The pusher device maintains a level of parts on an entrance conveyor. The entrance conveyor conveys the parts in a continuous, end-to-end stream to the workrest of a centerless grinder. Steel shafts elevated from the hopper via a cleated belt and deposited onto a front-end mounted, cross-feed conveyor. The conveyor translates the parts in a continuous, end-to-end stream to the workrest of an OKAMOTO Centerless Grinder. Valve seat inserts elevated from the hopper via a cleated belt and discharged in a continuous rolling stream at 20°. Metal tubes elevated from the hopper via a cleated belt and fed oriented in a continuous end to end stream with axis horizontal onto existing conveyor. Motor shafts loaded diameter-to-diameter in the part tub. The parts are elevated from the hopper via a cleated belt and deposited onto a front-end mounted, cross-feed conveyor. The conveyor translates the parts in a continuous, end-to-end stream to the workrest of a centerless grinder. Inserts elevated from the hopper via a cleated belt and discharged in a continuous stream. The parts are deposited in a continuous, face-to-face stream to the workrest of a Landis Model 350-20 RK Centerless Grinder. Feed from a random loaded, floor mounted hopper, input shafts. The shafts are elevated from the hopper via a cleated belt and deposited onto a cross feed conveyor. The conveyor translates the parts in a continuous, end-to-end stream to an automatic, air-operated “shifting mask” orienting device. The orienting device discharges the shafts with threaded end leading, axis-horizontal onto discharge conveyor equipped with an air-operated transfer device to load four parts at a time into customer’s V-Nest loading an induction hardener. Accepts steel sleeves from customer’s manually loaded totes at random onto a bi-directional conveyor. Tubes merge from the in-feed (load) lane onto the orienting lane conveyor are discharged in a continuous, end-to-end stream to the workrest of a centerless grinder.